So now, I've bullied you into realizing that your current shoe choices may not be the best for long term health. Fret not! Small changes can have great effects. Let me start off by saying that there are TONS of great PT and general foot exercises out there. Here are just a few of my favorites for now, but I'm sure I'll add more. 1. Sitting seiza vs. sitting kiza. This rock-star dude is demonstrating these two positions. The top position is with the toes tucked, ankles together, or kiza. It is a position in many different movement traditions, including some martial arts and bodu. It's also intense and stretches out the myofascial tissue in the sole of your foot. Sitting seiza is with the tops of the feet down, stretching out the tops of the ankles. This can be really intense, and to deal with it, I give students a rolled up blanket under the tops of their feet. 2. Stretch out those adductors (to prevent bunions). The adductors of your toes get incredibly tight from those tiny toe boxes. I like to wear these toe-spreaders every day, but you can also rock these socks if it's too cold to go barefoot in your home. Neither is very expensive. General toe socks won't really stretch your adductors in the same way that these two do, but they can be a reminder that you have more adduction range in that area than you realize. You can also manually interdigitate, which Susan McLaughlin explains in good detail on her excellent blog. 3. Roll it out! Grab a Yoga Tune Up® Ball, a Pinky Ball, a lacrosse ball (a bit more intense) or a tennis ball, and start to roll out the bottom of your foot. Try it free form-roll along the inner arch, the outer arch, sideways, front back, let the ball sink into the ball of the foot and heel...you get the idea. Here's a YTU® video to start. 4. 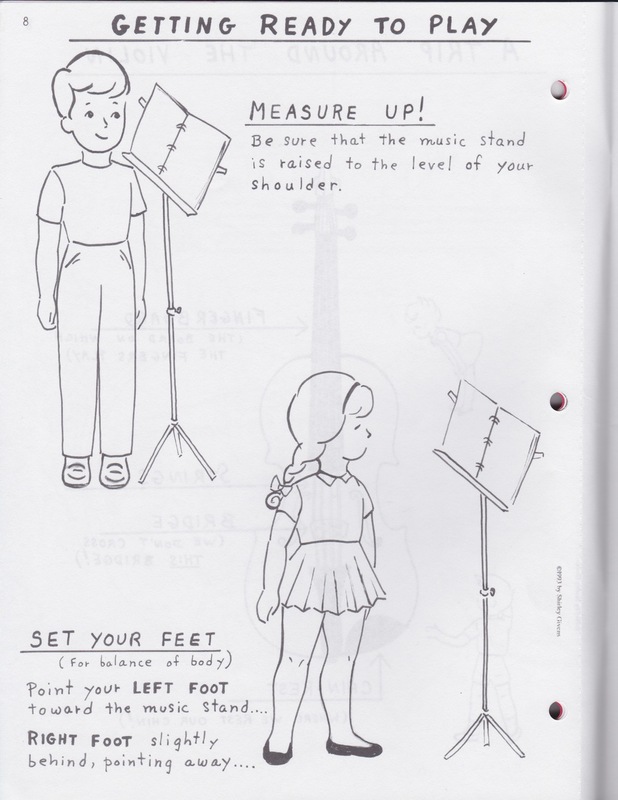 Make an outline of your feet on paper, like you did when you were a kid. Then take that map and compare it to your shoes...notice which shoes don't give you space for your toes/width/bunions/etc. 5. Try grabbing things with your feet (just for fun and dexterity.) When I teach kids yoga, I give each kid a batch of marbles that they then have to carry with their feet/toes to a jar. It's definitely insightful and fun. 6. Try toe taps (not the pilates move). Try to lift up both of your big toes and none of the other toes. Then try to lift just your "pointer" toe...and then your middle toe...and then you realize it's not really possible. You can manually lift up and hold down those toes in alternation just to bring some awareness to that area. These are just a few ideas to start-more to come! There have been a good amount of useful articles lately about shoes and how they impact our posture and our spine. Why should you care? Question 1: Do you have back pain? What about knee pain? Question 2: Do you have bunions or baby bunions? Question 3: Do you have plantar fascitis? Yes? Then you should care. One of the tricky aspects of a performance based career is the performance attire, which for women, often translates to tall high heels with a small toe box. Men aren't off the hook either though! A small toe box (like these guys) can translate to gait issues and bunions. Add that to wearing crazy dress shoes a few days a week, coupled with high heel boots, flats with small toe boxes, and turned out feet, and it's a disaster waiting to happen. 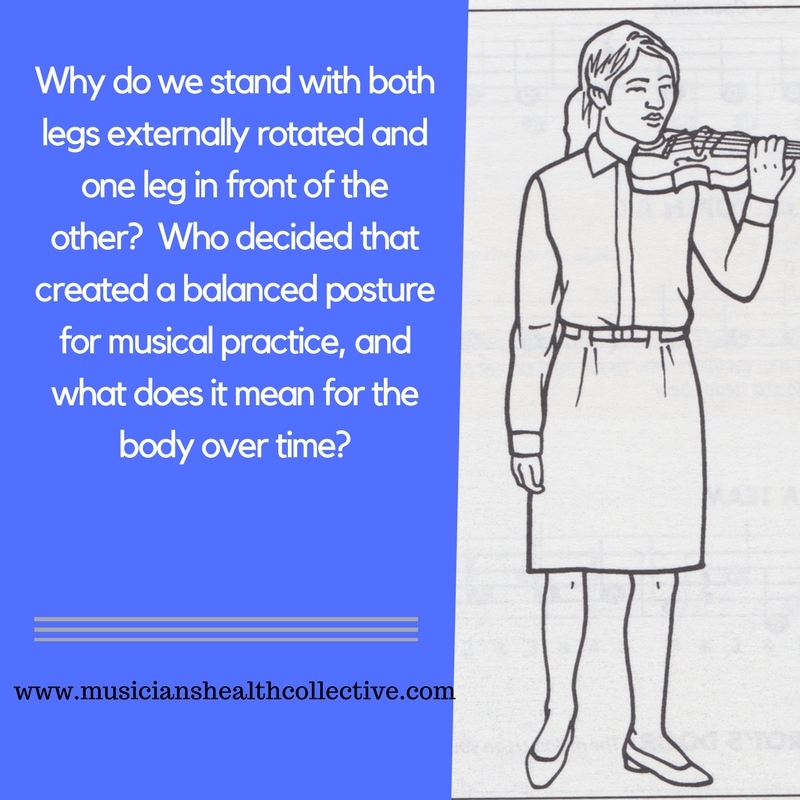 Not only that, your feet are the root of your standing position, whether it's in performance or in life, and can be the source of a whole chain of postural and muscular imbalances. Even doctors 70 years ago knew that small toe boxes hurt the feet-yet we still have so many uncomfortable shoe options! This is from my 1940's book "The New Modern Home Physician." First thing-what's a bunion? Basically, the muscles and bones around the big toe start to create a bulge on the medial side of the foot and the big toe turns laterally. Huh? Not only is it uncomfortable, but it's not pretty. Both men AND women get them, and it's not just from high heels. Notice how in the first image, there's space for the toes to spread a little. Then in the second, the toe box (i.e. the space in the shoe for the toes) gets smaller and the toes start to cramp. And then the third, the pointy shoe, is just a full out bunion fiasco. Basically, you just want to have more space in your shoes for your toes! I've seen this image in a few places, name Katy Says and a bunch of other foot related blogs which I think borrow it from her. Second- how do high heels affect things? First of all, smarter foot people than I have written TONS about this, so if you're curious, there's lots more to read. 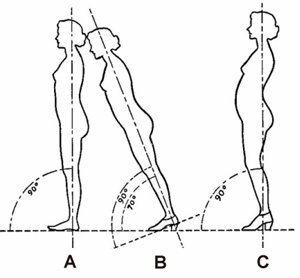 When you wear an elevated heel, you increase the posterior tilt of the pelvis which is a causation of the slumping of the upper spine. In addition, heels flatten the natural curves of the spine, the weight distribution between ball of foot and heel is disrupted, and you start to reduce your joint range of motion. Not only that, but you start to walk weirdly, taking little teeny steps and overarching your thoracic spine. Remember, this includes all heels, which includes running shoes, boots, dress shoes, etc, not just fancy high heels for the ladies! Notice how in the first picture, the woman has a natural curve to her spine? The second image shoes how our gravity is pitched forward in heels (any heel here, folks), and the third shows the repercussions. This woman bends her knees more, and the curves in her spine are exaggerated. Some folks do the opposite, and hyperextend their knees and flatten their spine. Here are a few other postural variations- the first example is similar to the above image, the second shoes more thoracic slumping, the third shows a neutral position, and the fourth shoes the hyperextension of the knees leading to forward thrusting of the chest. Does that sound comfortable? And in addition, there are a TON of articles attempting to defend high heels. Use your own myth busting skills here and think about it! Next post will be on some solutions to these dilemmas, as none of us (including me!) are free of heeled shoes with small toeboxes.